The Old Town Hall built in 1772, situated in the market place, was finally demolished in 1883. Burton Borough Council, formed in 1878, had to conduct council meetings in the back room of a public house! In 1882, Michael Thomas Bass II donated Saint Paul’s Institute and the Liberal Club to the town. His son, Michael Arthur Bass (later Lord Burton), further improved them in 1888. 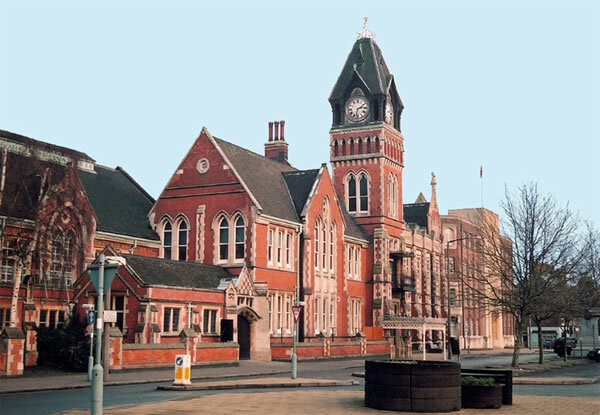 The two adjacent buildings were donated to Burton Borough in 1891 as a much needed Town Hall. A replacement Institute was built near Saint Paul’s and replacement Liberal Club in George Street were also donated by Lord Burton; both were opened in 1894. The Town Hall has twice been extended to incorporate civic and council office space.